Every e-commerce store needs a magento contact form extension to allow consumers to approach store owners with ease. A good contact form although, is easier said than done. You may think a little piece of code from the internet would do the trick, but allow us to forewarn you of the security implications that an inefficient Contact Form could have on your store! An ill-built contact form is a very first doorway for hackers to take control of your store. So what’s the solution? What is a Magento contact form plugin? Extensions are reusable Magento components that work universally on any Magento store to deploy added functionalities on a live Magento store. The extensions can be plugged into your Magento store without the need of developer expertise. An instruction manual is more than enough (and mostly not even required) to employ an extension in your Magento store. If you got two left hands in dealing with technology, our readily available remote technical help makes it super easy to get up and running in a jiffy. A Magento contact form plugin such as Velan’s Easy Contact Form Plus, is a quick way to add the contact form functionality to your store. Once plugged in, a “Contact Us” option shows up on your website as an easy-to-locate floating widget which is always available for your customers! 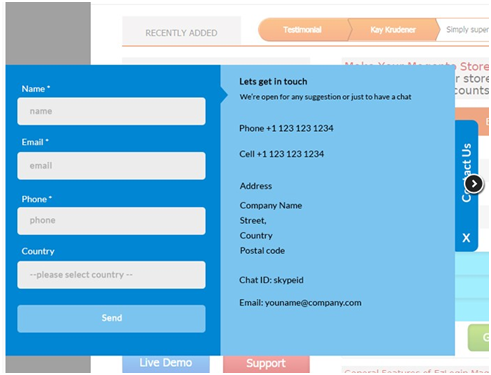 The Easy Contact Form Plus is a fully customizable contact form extension! We offer comprehensive backend control to help blend the form into your existing website. 5.Setup validations for each field: No more junk data in your contact forms with in-built easy-to-use validations in our feature-packed Magento contact form plugin! 6.Customize a “Thank You” message: From highly formal to fun or quirky, you can write your own “Thank You” message for customers who submit the form. Head over to Velan Store or just click here. Need more information or assistance? Call us at +1 (516) 717 2049 or contact us - our executives would be happy to help!